It’s a cold & snowy February, there are exams & assignments due everywhere, stress is high and quality time at an all-time low…what’s a sister to do?! 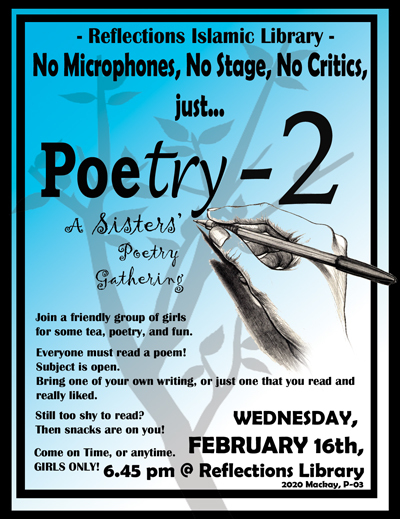 Well, guess what…The Sisters’ Poetry Gathering is BACK!! Wednesday, February 16th, starting at 6.45pm, Reflections Library is going to offer you an abode full of thoughtful words, delicious snacks, hot tea and sisterhood! Join us for a night of poetry and stories. Bring something you wrote or something you’ve read and liked, and don’t be shy – it’s an amateur fest! Any subject you deem worthy goes. You can also contribute to the food-fest with finger-foods or baked goodies. We’re going to transform Reflections into an exotic location insh’allah… Come and get transported into a warm night in the Orient! Reflections Library invites you to take a break from studying whatever you’re studying, and drop by for a little sit-back-and-learn about some great achievements of the Islamic civilization and its repercussions on European history. Wednesday, February 9th, at 7pm, we’ll be screening the BBC documentary film “Islamic History of Europe” starting at 7pm. We plan to show the first half of the documentary, which is 45min, but those who wish to stay can finish watching the whole thing. Optional discussion will follow. Everyone is welcome to attend. Relaxed learning, TEA & COOKIES guaranteed! SEATING IS LIMITED. Welcome to Reflections Islamic Library Online! 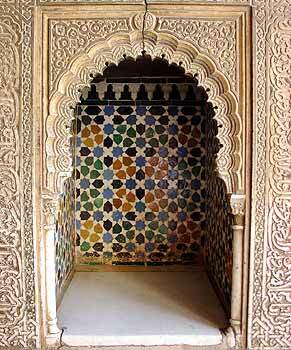 Posted on October 23, 2010 | Comments Off on Welcome to Reflections Islamic Library Online! Comments Off on Welcome to Reflections Islamic Library Online!